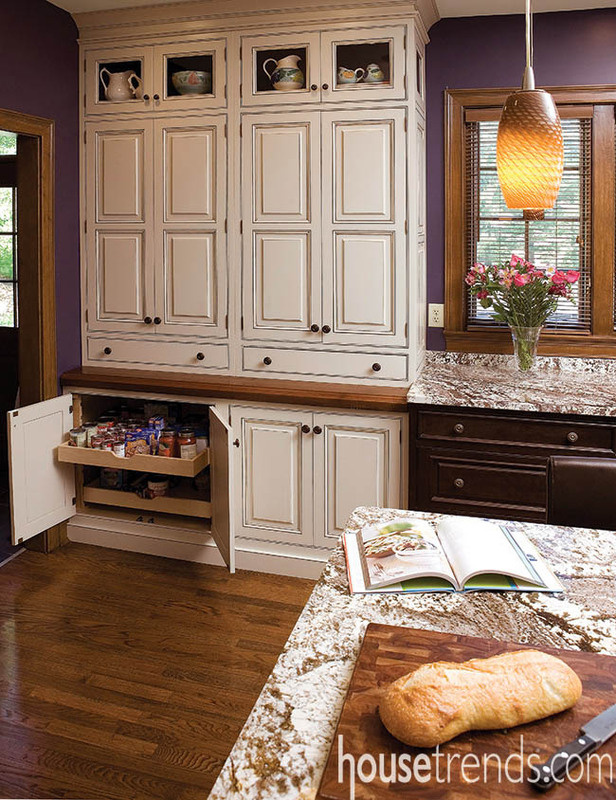 Rich brown painted backgrounds allow collectibles to pop inside these glass faced upper kitchen cabinets. Joe and Pepe Squeri are very busy people. They own a thriving business, S&S Construction, and have seven children, ranging in age from 12 to 29. Even though the 29-year-old does not live in the house now, the other six plus their parents needed an updated kitchen with colossal amounts of storage in which no one would be bumping elbows. 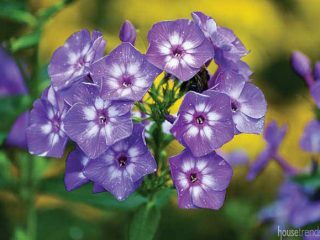 But it all really started with the need for new, not to mention modern, appliances. “The appliances were ready to go, so we decided that we wanted to update the whole kitchen,” explains Pepe. About that same time, the couple stumbled upon the good folks at Howard’s Kitchen Studio at a home show. 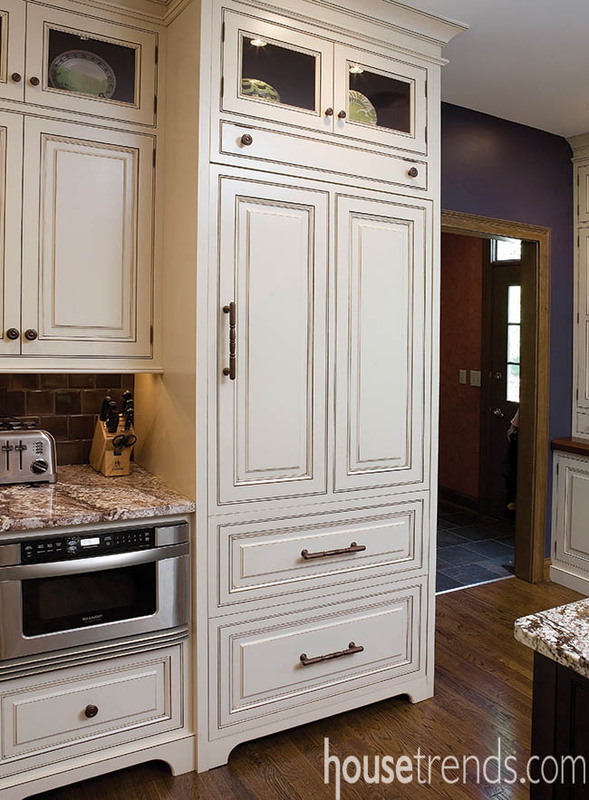 Perhaps it was fate, as that was the very same company that had installed their kitchen cabinetry when they first built their house almost 20 years before. 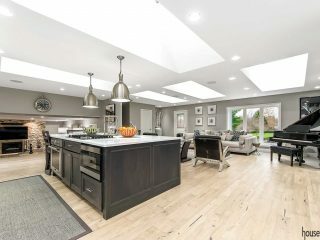 During the design phase, as they worked with Sandee Daye, a kitchen designer with Howard’s Kitchen Studio, the Squeris noted that not only were the appliances outdated, they needed more storage and countertop space, but did not want to partake in a costly renovation or include an addition. 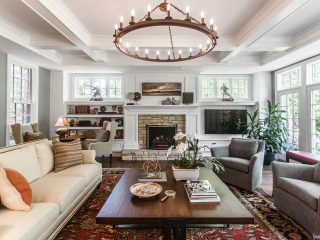 Although the renovation kept the same footprint, ideas such as ceiling-high cabinetry and the matching coffee bar that leads from the kitchen into the family room, make the room live large. Pepe wanted pantry storage, but did not necessarily want the same old closet or typical pantry cabinetry. Daye came up with idea of having the pantry as a wall of extra-deep cabinetry so that Pepe and the kids could easily access items without rollout trays. “I love that pantry area,” says Daye. The family does a lot of entertaining and they definitely wanted to keep an island in the kitchen; they just added more seating and storage. For that island and the row of cabinets under the windows, a dark cherry overlay selection from Mouser with a graphite stain was chosen. 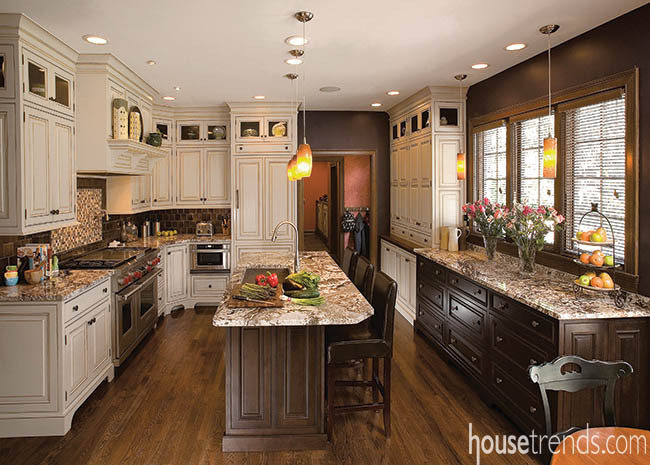 That cabinetry complements the inset maple cabinets with a Burnished Eggshell stain seen throughout the rest of the kitchen, as well as the preexisting wood flooring with walnut stain. 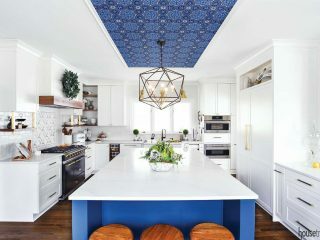 The ceilings are high in this kitchen, but an old soffit was removed to open the space visually without tearing down walls. 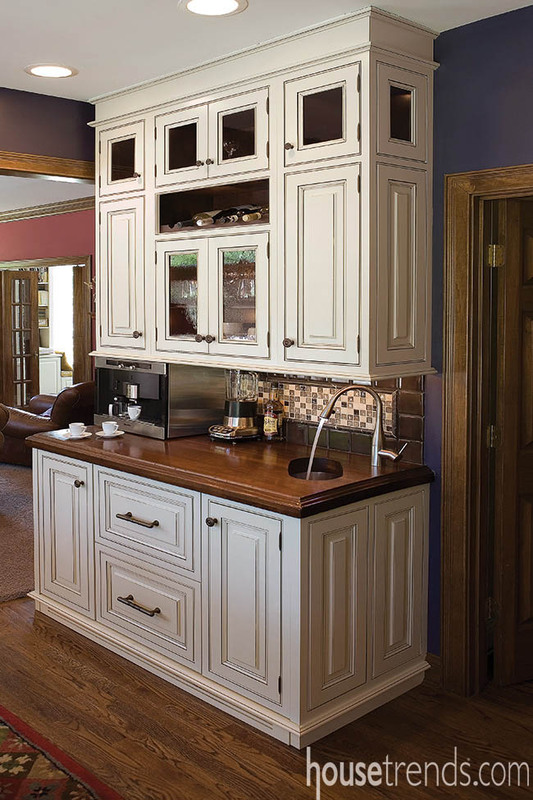 The cabinetry was then taken almost up to the ceiling and topped with two-piece, crown moulding. “This is part of the expression I wanted, to have the cabinetry look like furniture,” explains Daye. 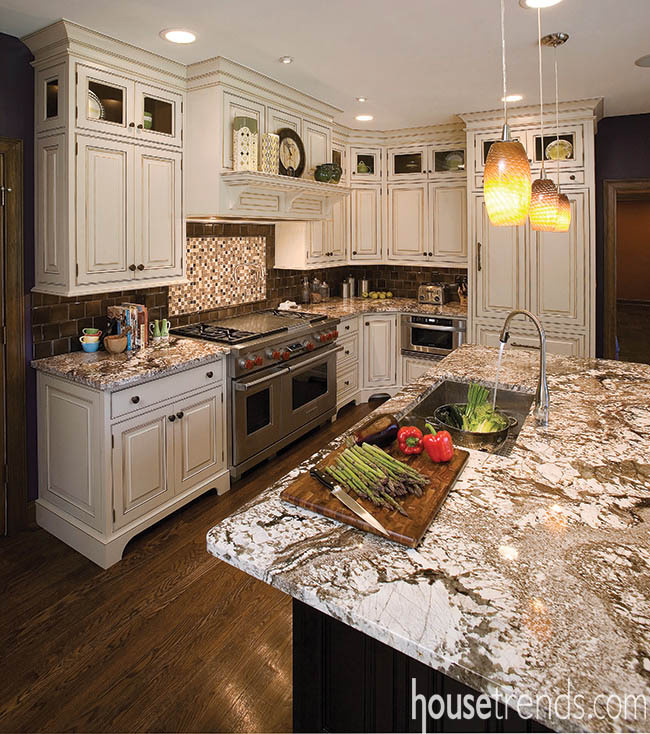 Not only are there two types of cabinetry, there are also two types of countertops. 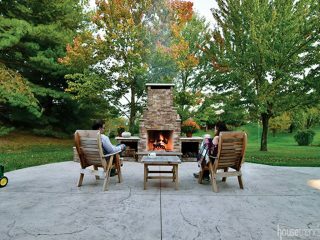 Pepe and Joe had the chance to explore a granite yard to find just the right slab, in this case an example called Silver Persian, that spoke to them. Extra-thick, 2½-inch walnut was used for the counter at the pantry and coffee bar as a counterpart to the granite. The appliances are prime for an article all to themselves. There is the substantial Wolf stove that Pepe absolutely wanted. “We had double ovens before, but now the Wolf stove is the focal point. 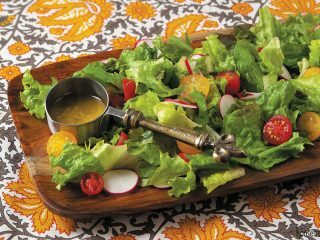 The appliances were important and make a big difference when cooking,” shares Pepe. The only other appliances that can be seen in the kitchen are the microwave drawer, yes drawer, adjacent to the stove and the Miele coffeemaker positioned on the coffee bar. “The microwave drawer is great because it is easy to pick up hot items without worrying that they will spill on your head,” laughs Pepe. 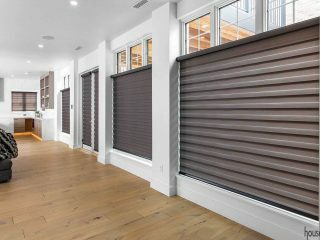 All other appliances, including a warmer, refrigerator, freezers, dishwasher and trash compactor, are integrated into the cabinetry via drawers or paneling that make them almost invisible. One of Joe’s favorite aspects of the redesigned space is the coffee bar. It has an undermount sink that Daye found would add even more interest to the piece, but the Miele coffee system is an absolute hit with Joe. The convenience of the integrated icemaker and refrigerator drawer is a plus, too. Daye notes that the two drawer appliances are from different manufacturers, and she had to really apply her design aplomb to finally figure out how to align them. As Pepe so aptly stated, the focal point of the kitchen is the beloved Wolf stove accented by a unique backsplash. The small squares are made up of crushed glass set in resin, which gives them shine. 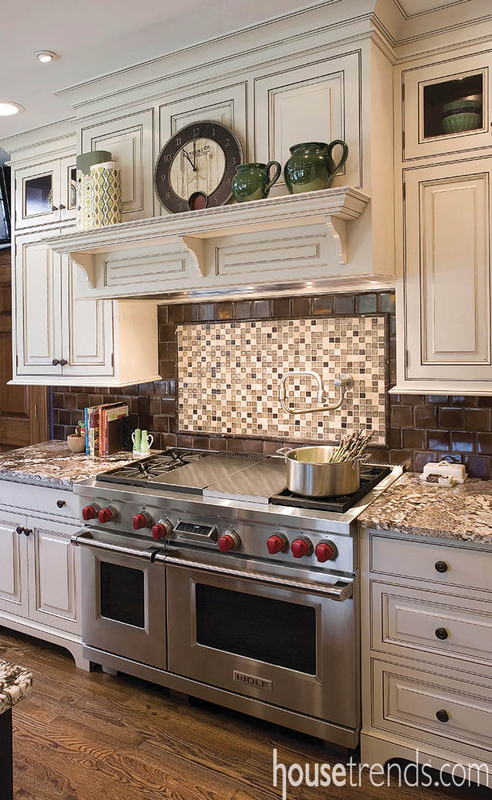 Ceramic tiles frame the smaller tiles above the stove and again in the coffee bar backsplash. “It is something a little different at this point,” says Daye.